As a leading Canadian recycler, we accept and collect all of your recyclable material. Is grey in colour. It is non magnetic and as the name suggests stainless steel is highly resistant to stains, corrosion or rust. The main ingredients in Stainless steel are iron, chrome and nickel making it resistant to heat. Stainless steel also has anti bacterial characteristics, and as such is used in the food processing industry. Stainless is also used in hospitals, automotive, schools, and restaurants to name a few. Type 304 stainless steel is a T 300 Series Stainless Steel austenitic. It has a minimum of 18% chromium and 8% nickel, combined with a maximum of 0.08% carbon. It is defined as a Chromium-Nickel austenitic alloy. Grade 304 is the standard “18/8” stainless that you will probably see in your pans and cookery tools. Here’s an interesting fact: recycling one aluminum can save enough energy to run a TV for 3 hours. And while it can be a simple task to just throw your aluminum can into the recycling bin, chances are you haven’t considered the actual numbers and figures you are contributing to when it comes to scrap metal recycling. Most scrap metal is collected from old steel structures, cars, appliances, ships, railroads, factories, waste electronics and other sources that contain metal in some way. Scrap metal gets processed in factories where they melt it down to commodity grade material that is used to produce new products. 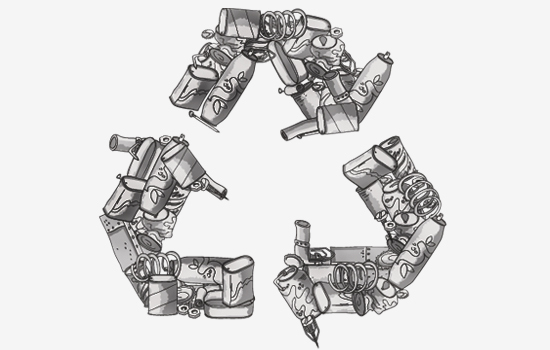 There are plenty of noteworthy facts on metal recycling to discover. Here are 15 interesting facts on metal recycling. Metal recycling is good for the national economy and the environment e.g. increased local employment and reduced emissions. You can test which metal is in your bin is by using a magnet. Aluminium metal is non-magnetic whereas steel is magnetic. Drink cans are generally made from aluminum while food cans are usually made from steel. Metal recycling helps recreate new product once the original items has reached the end of its useful life. Recycling scrap metals including iron and aluminum can be benefit local construction project such as roads and bridges. Scrap metals are refashioned for use in creating bikes, cars, aircraft and other modes of transportation. Scrap metals aids in storage and transportation of goods across the world with many shipping containers created from recycled metal. Reusing scrap metal has supported many industries to reduce their environment impact e.g. reduced mining of natural and scare resources. Recycled aluminum can be melted at a much lower temperature than new aluminum therefore saving on energy. Scrap metal recycling helps reduce Co2 emissions created through mining, transport and smelting. Recycling scrap metal reduces the need for landfills sites and leads to a positive effect on water supply, soil and land usage. Aluminum is made from a mined ore called Bauxite, which is converted into alumina, a fine white powder. This powder is then smelted at over 700°C, to become aluminum. The process is expensive and uses lots of resources including energy and fuel. The aluminum used in packaging is much more difficult to collect, since it is very light. It is discarded in every home, school, office, pub and restaurant without a thought so remember light metal e.g. kitchen foil. Scrap metal recycling is an essential part of the manufacturing industry. This includes steel, iron, and nonferrous metals like aluminum, copper and copper and lead. Using these secondary materials instead of virgin materials saves energy and reduces greenhouse gas emissions.